Newly protected farmland in the Town of Red Hook.Robert Rodriguez, Jr. 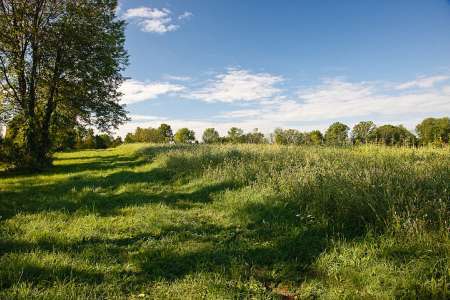 These rolling fields and woods span four contiguous farms ranging in size from 24 to 124 acres. Ninety percent of this land is rated Prime Farmland by the U.S. Department of Agriculture or contains Soils of Statewide Significance. Partnering with the town to purchase development rights to each property, we’ve guaranteed all will remain working, taxpaying farms . The transactions continue our support of Red Hook’s agriculture-based economy and efforts to preserve its rural character while promoting “smart growth.” Since we initiated protection of the town’s working farms in 1998—when we conserved 1,000 acres on seven farms—an additional 900 acres have been saved with the help of local and county governments, the Dutchess Land Conservancy and the Winnakee Land Trust. The new acquisitions abut Clermont State Historic Site and another farm protected by Scenic Hudson, meaning 1,011 acres of contiguous land spanning Columbia and Dutchess counties now is preserved forever. The purchases are part of Scenic Hudson’s collaborative campaign to Save the Land that Matters Most, protecting 65,000 acres of great scenic, ecological and agricultural significance.